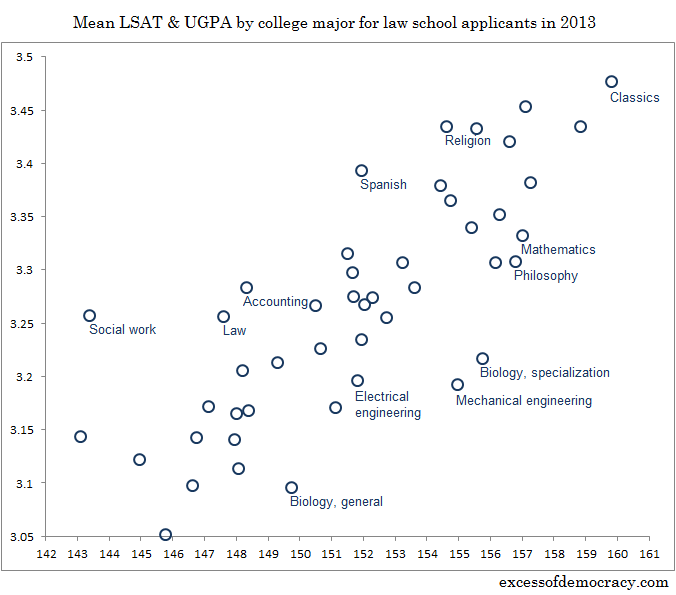 Yesterday my colleague Steven Ramey posted about a recent study of those who took the 2013 Law School Admissions Test (LSAT) — their undergraduate GPA, their undergraduate major, and their LSAT score. 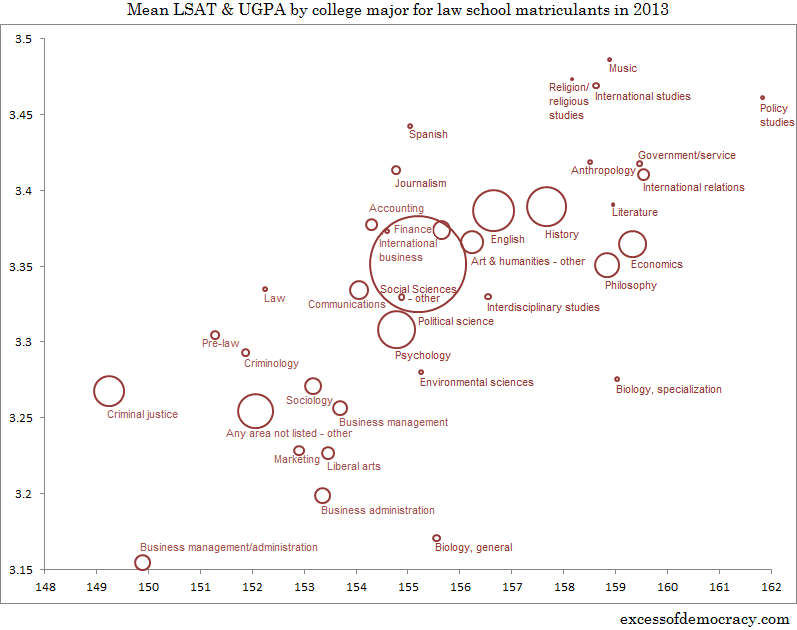 The means for each major were then graphed (above), with undergrad GPA on the vertical axis and LSAT score on the horizontal, making Classics majors (far top right corner) the highest preforming by both measures. 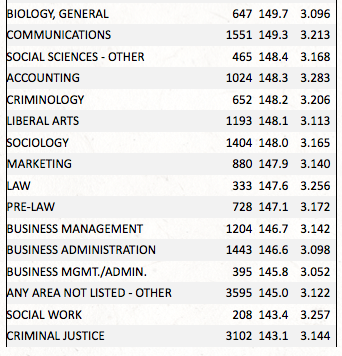 But you may notice that Religious Studies majors are also near the front of the pack (near the top right of the graph). 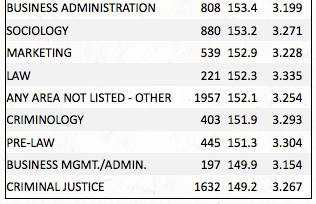 Their LSAT score is just a little off the leader pack, yes, but their GPA makes them stand out — combined, they’re apparently strong contenders for law school. But why am I reposting all this? First off, I agree completely with Ramey: “Does it even make sense to generalize about students who major in a discipline, using statistics such as test scores and GPAs? Probably not,…”. But with this in mind, what bothers me is how Departments and disciplines supposedly devoted to teaching critical thinking routinely portray some necessary connection and, in so doing, cannibalize each other in their rush to attract undergraduate majors. Instead of some sort of coordination across broad domains, involving a variety of fields, we’re all left to our own devises in the zero-sum game of scrambling for the coin of the realm: majors (and thus eventual graduates). Thus, regardless how your students actually do on, say, the LSAT test or their studies in your program, you work very hard to persuade everyone that if they want to become a lawyer, well, then they’d better major in X or Y. But, sadly, too few students see this for what it is — marketing — suggesting that actually teaching self-reflexive critical thinking may not be as high on certain majors’ lists as they might say, for their numeric success depends on no one seeing behind this particular curtain. So, what does one do with data such as this? That I’m the Chair of a Department of Religious Studies and I’m writing a blog post about it indicates that I can’t resist the temptation to use it somehow. But I’d prefer not to use it to justify developing a pre-Law track (as I know other units have done) and thereby try to corner the market on law school hopefuls. 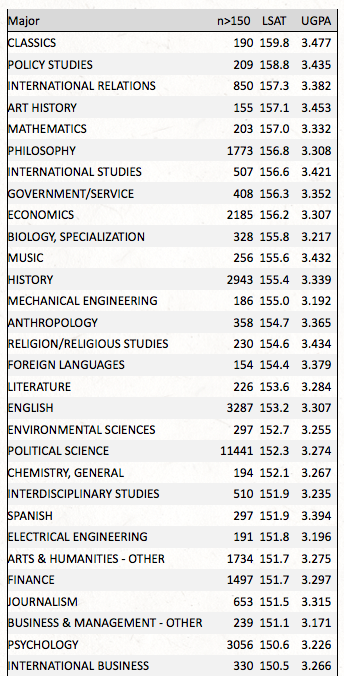 Instead, I think the way to use this data is to continue doing exactly what we’re already doing in our Department: using a variety of opportunities to make evident to students, parents, colleagues, and administrators that, like so many other fields, the academic study of religion is not necessarily about the data (as interesting as someone may or may not find it). No; instead, it is all about the tools that we offer to students who are interested in thinking about issues of similarity and difference, issues of description, interpretation, and explanatory analysis — interested in making their world a little more complicated than they at first thought by considering how “they” do this as opposed to how “we” do. For it seems to me that these are the skills that are necessary for success in any profession, let alone in adult life. We haven’t got a monopoly on teaching these skills, of course, but neither do other fields have exclusive rights to prepare people to be lawyers — let alone any of the many great carers that our grads have gone into. All of which is a nice way of saying that you should keep an eye out for who we bring back next academic year as part of our Grad Tales series — we began it this year with four great grads and plan to continue it next year, making sure that the wide relevance of not just the academic study of religion but also the liberal arts is more than apparent to all of our students. This entry was posted in Faculty Blog, Relevance of Humanities, Religion in Culture and tagged Critical Thinking, Grad Tales, Humanities, Law School, Liberal Arts, LSAT by Russell McCutcheon. Bookmark the permalink.